Thúy was born in 1968 into war-torn Vietnam. As a child her family made the heart-wrenching decision to leave their home in Saigon and take the troubled journey to a refugee camp in Malaysia before eventually emigrating to Quebec, Canada. Although she lived through a childhood which most would consider devastating, Thúy humbly insists that it is important to see things relatively; ‘We were very lucky, we were only in a camp for a very short period, for only four months, and our boat trip lasted only four days’. She reflects that, for many the evacuation overseas took weeks and people ran out of water and food. If they managed to survive the perilous journey, many then faced an indefinite duration in the camps, where thefts, rapes and violence became a familiar ordeal. 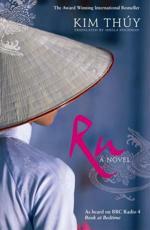 It is for this reason that Thúy insists her novel Ru - which follows the story of Nguyễn An Tịnh, a woman forced to leave her home during the Vietnam War - is not so much about her own experiences, but about ‘the lives of many bold people’ who went on the hazardous quest to escape from the horrors of war and repression. ‘We talk a lot about difficulties and hardship, but to me, they were just great challenges,’ Thúy explains to CBC News. ‘I feel very lucky that I had the chance to live them.’ ‘Lucky’, of course, because many never had the opportunity to leave, or live, at all. Thúy has worked as a seamstress, restaurant owner, interpreter and lawyer, but she now resides in Montreal where she devotes her time to her writing. Ru has won a series of awards including the 2010 Governor General’s Literary Award for Best Fiction, and has been published in 20 countries.